Just before half term I received the following email from a Headteacher of a school I have been working with, the school had approached me a year or so after being given a: ‘Requires Improvement’ rating in an Ofsted report and wanted me to work with them on embedding ideas as outlined in my book Trivium 21c. Just wanted to let you know that we have just had a section 5 Ofsted inspection, which has gone really well. You may be pleased to know that Trivium featured quite strongly in the inspectors’ feedback. One of the inspectors had read your book and the whole team were impressed by the vision that we have set out for teaching, and the impact that Trivium is already having in some subject areas (Science and maths) in such a short space of time. In their conversations with teachers and middle leaders they reported that many teachers were discussing Trivium as a way of developing their curriculums and teaching methods. In addition, the inspectors were impressed with our ideology of interleaving all the great work we do on character development and care and guidance with teaching and learning through the three elements of Trivium. Thanks for your work with us, it really seems to be working. I am pleased to report that the school was rated ‘Good’ in the inspection. Great leadership is at the heart of the three major reforms Ofsted is making to inspection from September 2015. Using the new common inspection framework, inspectors will look at leaders’ vision and ambition for all children and learners. They will want to see how leaders set the culture of their school or provider and how they ensure that all learners – particularly the most disadvantaged – make strong progress from their different starting points. The vision I have for Trivium Schools is that each school begins with an idea of what education is for and it is this that shapes the culture of the school. It is through the three ways of the trivium that the vision can be made to work in a concrete way. The trivium of grammar, dialectic and rhetoric gives teachers a language through which they can discuss how teaching and learning works at a school level yet also a way to examine the very real differences in the way each subject is taught. Every school I have worked with use the trivium in different ways, such is the beauty of the tradition, it enables schools and teachers to be confident in their core purpose of educating their pupils to make real progress in the pursuit of wisdom. If you would like to know more about Trivium Schools you can contact me here. 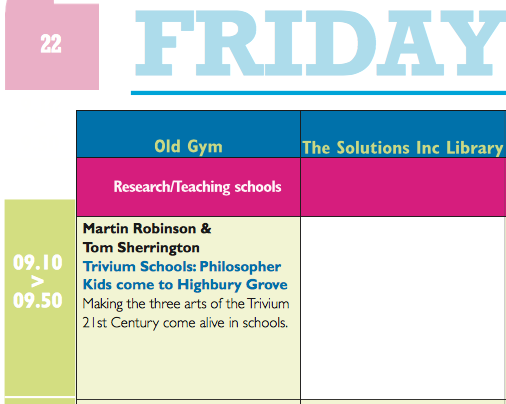 I enjoyed talking about this at the Sunday Times Festival of Education at Wellington College, on Friday 19th June 2015 with Tom Sherrington the Headteacher of Highbury Grove School about The Philosopher Kids of North London and the three ways of the Highbury Grove Trivium: Knowledge, Exploration and Communication.